ROUSH CleanTech designs, engineers, manufactures and installs dedicated liquid propane autogas fuel systems for light- and medium-duty Ford commercial trucks and vans. Propane autogas can significantly lower your emissions, your carbon footprint and reduces your fleet’s fuel costs by 40% or more. 1) PRODUCT OVERVIEW shows details of fuel tank configurations and vehicle specifications that are eligible for conversion to run on clean-burning propane autogas. 2) SAVINGS CALCULATOR lets you type in your typical vehicle life (in miles), fuel economy and number of years the vehicle is kept in your fleet. From there, the app automatically calculates how much money you can expect to save by operating the vehicle on propane autogas instead of gasoline. 3) EMISSIONS CALCULATOR uses your average vehicle life (in miles) and fuel economy to show how many pounds of CO2 you can expect to reduce from your company’s carbon footprint by operating that vehicle on propane autogas instead of gasoline. Propane autogas reduces greenhouse gas emissions by 24%, carbon monoxide emissions by 60%, and nitrogen oxide (NOX) emissions by 20% compared to gasoline. Propane autogas is typically 40% to 50% less expensive than gasoline on a per-gallon basis. Over 90% of the propane used in the United States comes from domestic production, with another 7% coming from Canada, making it a stable North-American produced fuel option. ROUSH CleanTech propane autogas fuel systems meet all FMVSS, NHTSA, NFPA 58, EPA and CARB certification standards, and the narrowest range of flammability of any fuel. 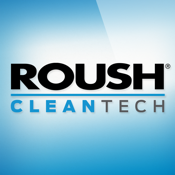 For more information, please visit ROUSHcleantech.com or call 800.59.ROUSH.